Ah, finalmente! Thrice I have been denied access to Rome’s beautiful Teatro dell’Opera di Roma–thanks to two strikes and one unexpected venue change. Lots of coins into the Trevi Fountain, return trips to Rome, and then last Saturday, a fourth attempt at Teatro dell’Opera—and finally satisfying success! I had expected my introduction to Rome’s Opera House would be a bel canto or Italian chestnut, but instead it was Benjamin Britten’s Billy Budd that presented the opportunity to not just check Teatro dell’Opera off the opera house bucket list, but also to attempt to resolve a major dramatic issue I have with the piece. Since its posthumous publication in 1924, countless literary and academic scholars have tried to decipher the meaning of Herman Melville’s Billy Budd, Sailor, but ascribing any single meaning to the work is as elusive as a French frigate in the mist. It’s this elusiveness that continues to fascinate and make the work ripe for interpretation. In their adaptation, Britten and librettists E.M. Forster and Eric Crozier rewrite the fate ascribed to Captain Vere by Melville. While the pedantic seafarer dies in the novella where his last opiate-addled words are “Billy Budd, Billy Budd,” the opera jettisons his demise and instead inflicts on him the regrets of old age. Melville’s third-person narrator is supplanted by the addition of a prologue and epilogue in which Vere takes center stage, thus reframing the drama as his story of salvation. That salvation—musically represented so ecstatically in the epilogue—has always been problematic to me. Parterre’s late, indomitable Albert Innaurato frequently instructed readers to look at the score for answers. So, to the score I went. The result was incredibly illuminating, although I uncovered as many new questions as I answered old ones. With a much greater understanding of the work’s musical structure, I was eager to see how it informed the performance. Like its operatic creators, director Deborah Warner has added her own prologue to the drama. Upon entering the theater, one sees the stage is empty, save for a disheveled old man on his knees. At times he reads from a green book, at other times he uses the book as a holystone to scrub the floor. The book is later revealed to be Vere’s bible—the same bible upon which Vere and Billy swear in the second act’s drumhead court. Then the music begins—hypnotic waves of B-flat major and B minor ebb and flow—and Captain Vere enters. The old man and Vere take no notice of each other until Vere sings “Confusion, so much is confusion,” at which point they make eye contact, and the old man crawls toward the back of the stage. He will reappear in the epilogue where his identity as the guilt-ridden Captain is revealed. Successfully portraying the title character as the cynosure his literary creator intended him to be is not an easy assignment, but Canadian baritone Phillip Addis (replacing an indisposed Jacques Imbrailo on relatively short notice) delivered a compelling performance based on his savvy ability to appear beguiling while remaining guileless—a nearly impossible combination to achieve. Addis’s Billy is lithe, virile and athletic; his allure stems more from an inner goodness than from an outward innocence. The role fits Addis’s slender baritone perfectly. Billy’s quieter moments found the singer at his best: the lilting lullaby of “Look! Through the port comes the moonshine astray!” movingly sung. Yet when required, he also rose to the challenge of Billy’s more dramatic apostrophes to the “Old Right’s o’ Man”. In his role debut, John Relyea’sbdark, forbidding bass reveled in Claggart’s music. Relyea’s voice has grown fuller, richer and more malevolent. But with this added richness comes a loss of textural intelligibility that is so vital in delineating Claggart’s character. What helps to compensate for the lack of aural clarity is that Warner has coaxed the most dramatically committed performance that I have ever encountered from the bass. His great aria “O beauty, o handsomeness, goodness” was the tour-de-force it was written to be. Relyea’s Claggart is currently all brutality, but one assumes that with additional performances he will find greater depths to the Master-at-Arms multifaceted character. Filling out the trio of main characters, British tenor Toby Spence may not have the vocal allure of Relyea’s Claggart, but he offered the most complex performance of the evening. His clear vocal production made every word of the ascetic captain’s music intelligible. He seemed to tire by the opera’s epilogue, and his final line “There’s a land where she’ll anchor forever, where she’ll anchor forever,” which leads to the ecstatic B-flat major chord that crowns the scene and opera, didn’t pack the vocal punch it needed, but his was a fully realized portrayal otherwise. The rest of the all-male cast deserves equal praise. Stephen Richardson was especially moving as Dankser. The trio of Thomas Oliemans, Zachary Altman and David Shipley as Mr. Redburn, Mr. Flint and Lieutenant Ratcliff were particularly fine vocally and dramatically. And the chorus, under the direction of Roberto Gabbiani, was simply stellar. Conductor James Conlon and his orchestra did not have a completely successful evening. Britten’s woodwind and brass fanfares call for a precision and crispness that were missing through much of the performance, particularly in the first scene of Act One. Conlon’s tempi tended toward the brisk (most egregiously in the remarkable 34-chord progression that accompanies the off-stage interview in which Vere relays the death sentence to Billy), and the orchestra was not always responsive to the conductor’s cues. Entrances were murky where clarity was required. However, his handling of the glorious “Hilo” interlude between scenes two and three of the first act, and especially the opera’s final scene and epilogue were beautifully calibrated. Designer Michael Levine has set the opera on a nearly bare stage with a backdrop of vertical hanging ropes and horizontal light strips. The stage is sectioned off into three playing areas which can rise independently or together to various heights, raised not through a stage elevator but via metal cables that hoist the areas aloft. The cables also help delineate physical space–such as defining Captain Vere’s cabin. At times a series of vertical ladders descend from above allowing characters to move from one playing level to another. Yet despite modern appearances, the designer does not eschew all of the literal trappings of a British war ship. A giant sail is unfurled during Act Two’s stirring “This is our Moment” sequence, and ropes are hoisted throughout appropriate moments in the opera. Chloe Obolensky’s costumes may be more representative of twentieth-century military attire than the plot’s summer of 1797, yet there is a timelessness to them. Jean Kalman’s beautifully atmospheric lighting completes the austere but effective design. In her program notes director Warner states “The extraordinary triangle formed between the three protagonists plays and weaves a complex web… They’ve all three got parts of each other within them, and it is where these three merge, collide and crush that the piece becomes great.” Well, yes! Yet hard as I tried, I could find no directorial conceit that attempted to link those similarities. This convergence is certainly true musically. Britten assigns each of the opera’s three main characters a primary musical key: C major for Captain Vere, F minor for Claggart and E major for Billy Budd. The vocal writing for Claggart is rife with two falling fourths while Vere’s vocal lines are rich with thirds. Where Forster’s stilted libretto fails, Britten’s score illuminates in an incredibly complex intertwining of each character’s keys, intervallic leaps and leitmotifs. And while all three character’s musical vocabularies intersect, the greatest convergences are those between Vere and Claggart. Surely Britten saw Vere and Claggart sharing some genus or duality, but that dualism goes unexplored in Warner’s production. But there is much to admire in the production. Warner has clearly worked with her cast to create three dimensional characters, and the dramaturgy is realistically and often impressively thoughtful. 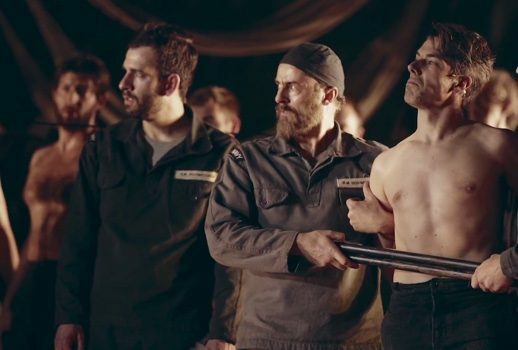 The opening scene deftly represents the often brutal, oppressive and repetitive bleakness of a conscripted service while equally demonstrating the ships social hierarchy. The staging of the near mutiny of the final scene is a masterful wedding of stage design and direction. Yet there are smaller details that hint at possible interpretive directions left unexplored. The scene between Claggart and the Novice is always unsettling. The Novice’s repeated line “I’ll do anything, anything…I’ll do anything you want” is especially disturbing. In Warner’s staging Claggart and the Novice are seated apart with their feet dangling from the raised platform. Claggart sings “Come here, come nearer. I’ll protect you if you don’t fail’ and the seated Novice moves close to the Master-at-Arms, their knees nearly touching. As the Novice sings “I’ll do anything to serve you, anything, anything,” he places his hand on Claggart’s thigh. Claggart does not immediately react, but when he does, it is a dramatic recoiling. I’m not certain if what I perceived as religious references were intentional or perhaps the result of too many previous hours spent exploring Rome’s churches and the Vatican’s vast collection of art. But in one of the productions most beautiful and haunting images, Claggart sings his denunciation of love atop the raised platform. Below, the sailors slumber in their hammocks. And directly below the standing Claggart lays Billy, his right arm dangling outside his hammock, his head listed to the side. It looked a direct reference to Christ’s arm in Michelangelo’s “Pieta” a position echoed to beautiful effect in both Caravaggio’s “Deposition from the Cross” in the Vatican’s Pinacoteca and in Bronzino’s “Deposition” in the Eleonora Chapel in Florence’s Palazzo Vecchio. Intentional or not, it is an intriguing reference. I found another reference in the staging of Billy’s death. Billy climbs the central ladder to his execution—his hanging, out of sight from the audience. On either side of the central ladder two additional ladders descend at unequal heights. The bisecting of the vertical ladders and horizontal lighting instantly reminded me of visual portrayals of Christ’s crucifixion at Calgary. Perhaps I saw these references as part of my search to find understanding around or resolution to the issue I have always had with what appears to be Vere’s salvation in the epilogue. I have never felt his catharsis is earned. While I have needed to work out my own rationale, I am always eager to see how a director treats this moment.